University administrators said the student's cause of death does not affect their increased attention to campus safety, as they prepare for more snow expected to hit this weekend. The University of Washington sophomore who died Wednesday after falling on campus died of natural causes, according to the King County Medical Examiner’s Office. Hayley Smith, 19, died of pulmonary embolism due to deep vein thrombosis, or a blood clot in her lung, the medical examiner’s office said Thursday. 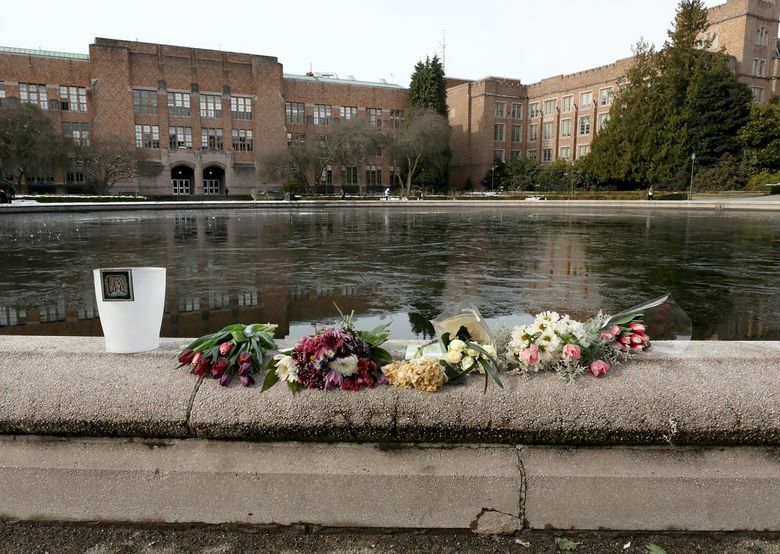 University of Washington President Ana Mari Cauce said how the student died doesn’t change the loss that is felt on campus or administrators’ focus on making campus conditions safe. Smith suffered a head injury after falling on a sidewalk near the Drumheller Fountain around 10:30 a.m. Wednesday, according to university officials. She was taken to Harborview Medical Center, where she later died, hospital spokeswoman Susan Gregg said. The campus had been closed Monday and Tuesday because of the snowstorm early this week. Major walkways and the general area where the student fell had been treated with sand and salt before classes resumed Wednesday, university spokesman Victor Balta said in an email. The sidewalk in the area where the student fell had both icy and dry patches, but the results of a university police investigation were consistent with information from the medical examiner’s office, UW Police Maj. Steve Rittereiser said Friday. “She did not slip as was first reported,” Rittereiser said in an emailed statement. Some students responded to news of the student’s death with anger on social media, saying the university didn’t do enough to clear walkways before students returned. Cauce said it’s natural to turn to blame in these kinds of situations. Despite the news of Smith’s cause of death, campus administrators have continued to discuss how to improve safety in hazardous weather conditions. “We always think, ‘Were there things we could have done better? '” Cauce said. The university’s vice president for facilities, Lou Cariello, said grounds crews will prepare more thoroughly for the snowstorm expected to hit Friday and Saturday by pre-treating walkways with sand and salt. The university hadn’t significantly pre-treated walkways before the last storm, and the response was more reactionary, Cauce said. The university will also try to do more to communicate snow safety with students, particularly those from out of state, she said. In anticipation of another snowfall, the UW said it will suspend operations at 12:30 p.m. Friday and all day Saturday.